Then the 40-year-old said he gave just about all he had in what he knew would be his final home game , which might make the last game of his career at San Antonio on Wednesday night little more than a curtain call. It’s a fitting finale in some regards because the Spurs were probably Nowitzki’s biggest rivals. The 14-time All-Star said the Mavericks bought more than 300 tickets in order for employees to attend what everyone now knows will be his final game. And the most accomplished European player in NBA history is merely playing out the string again in a third straight season without the playoffs, the longest drought of Nowitzki’s career. 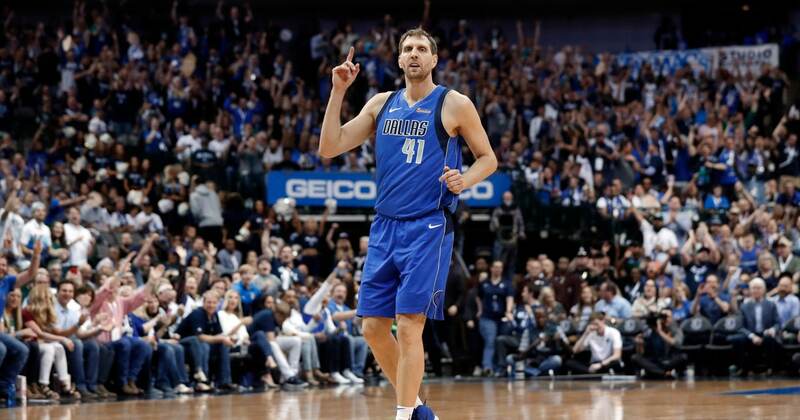 But on Nowitzki’s special night, nobody was thinking about the Mavericks never winning another playoff series with the best player in franchise history after he led them to their only championship in 2011. But the league’s 2007 MVP and 2011 NBA Finals MVP also knew how difficult the past two seasons had been physically, including missing the first 26 games of his final campaign after a longer-than-expected recovery from ankle surgery last April. Nowitzki was experiencing flare-ups in his feet and ankles late this season. The only 7-footer to win the All-Star 3-point shooting contest was the first player of his size to be a legitimate threat behind the arc. All of the game’s biggest stars say that dimension changed the game, and many of them emulated his signature one-legged fadeaway jumper — the shot he used on his final bucket at home late in the fourth quarter.